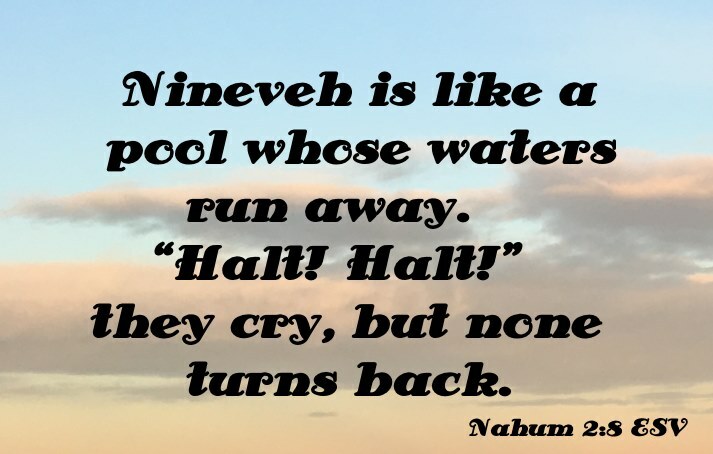 This description of Nineveh is from Easton's Bible Dictionary. 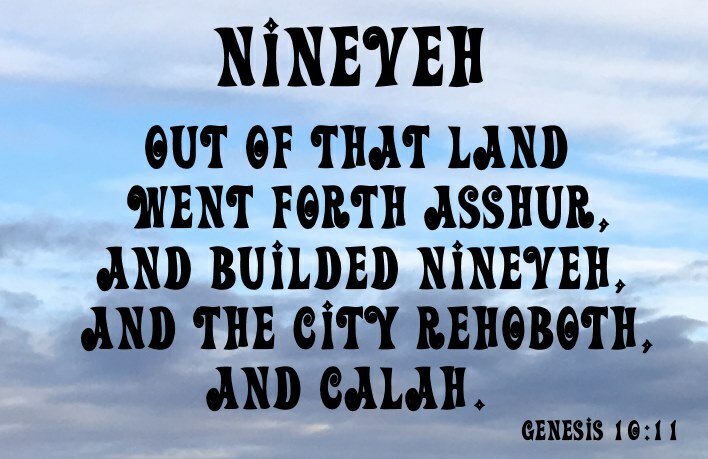 Nineveh: First mentioned in Genesis 10:11, which is rendered in the Revised Version, "He [i.e., Nimrod] went forth into Assyria and built Nineveh." It is not again noticed till the days of Jonah, when it is described (Jonah 3:3; 4:11) as a great and populous city, the flourishing capital of the Assyrian empire (2 Kings 19:36; Isaiah 37:37). The book of the prophet Nahum is almost exclusively taken up with prophetic denunciations against this city. Its ruin and utter desolation are foretold (Nah.1:14; Isaiah 3:19, etc.). Zephaniah also (Zeph 2:13-15) predicts its destruction along with the fall of the empire of which it was the capital. From this time there is no mention of it in Scripture till it is named in gospel history (Matthew 12:41; Luke 11:32). About B.C. 633 the Assyrian empire began to show signs of weakness, and Nineveh was attacked by the Medes, who subsequently, about B.C. 625, being joined by the Babylonians and Sasianians, again attacked it, when it fell, and was razed to the ground. The Assyrian empire then came to an end, the Medes and Babylonians dividing its provinces between them. "After having ruled for more than six hundred years with hideous tyranny and violence, from the Caucasus and the Caspian to the Persian Gulf, and from beyond the Tigris to Asia Minor and Egypt, it vanished like a dream" (Nahum 2:6-11). Its end was strange, sudden, and tragic. It was God's doing, his judgement on Assyria's pride (Isaiah 10:5-19). One of the most remarkable of recent discoveries is that of the library of King Assur-bani-pal, or, as the Greek historians call him, Sardanapalos, the grandson of Sennacherib (which see). This library consists of about ten thousand flat bricks or tablets, all written over with Assyrian characters. They contain a record of the history, the laws, and the religion of Assyria, of the greatest value. These strange clay leaves found in the royal library form the most valuable of all the treasuries of the literature of the old world. The library contains also old Accadian documents, which are the oldest extant documents in the world, dating as far back as probably about the time of Abraham.